Happy New Year! Add your times here. So if BEQ is now publishing at 6pm, probably his puzzles should move back a day on the blog schedule... Never mind, his schedule isn't changing after all. Merry Christmas! Add your times here. Or take the day off! I won't be offended. Hope everybody had a lovely holiday weekend. Merry almost-Christmas! Add your times here. Click to add your times! I'm flying to San Francisco early this morning, so I'll be a little late with the solving. Click here to add your times! I did some updating of the blogroll. Next up, the FAQ. Maybe a redesign? Nah, everybody loves the color scheme. Thanks for chiming in yesterday! This format should keep me interested for the foreseeable future. Link to today's Google doc. MORNING ADDENDUM: Don't miss the BEQ guest puzzle today! I don't know how to make the embedded spreadsheet scrollable... I can see the rightmost column by click-dragging inside. Sometime I'll look at re-formatting the blog so the main column here is wider. Here's the spreadsheet idea I mentioned yesterday. Click here to add your times if you want to play. There's no registration or anything, just enter a name and some numbers, and the embedded spreadsheet updates automatically (it will say "All changes saved" at the top of the screen). It's been almost three years since I started posting my times every day, and I don't think I want to continue indefinitely. What's the point? My solving isn't accelerating anymore, and there's enough data here for... I don't know what, but 6,000 data points should be statistically sufficient for it. Would anybody be disappointed if I only updated this site on the rare occasions when I have something useful to share? You can email me directly or comment. The other idea I had is to make this interactive -- if a half-dozen of you were willing to enter your times into a Google doc, through a handy link here that I'd update daily, we would have a more robust (and permanent) version of the Crossword Fiend leaderboard. I've tried that out and will include it on tomorrow's post so you can see what I mean. Kinda funny - two straight days with identical NYT and LAT times. Didn't have a chance to do the puzzles before my opening night. On the train back to New York, my colleagues were reading the NYT Arts section and had me do the puzzle. I can't remember the last time I actually solved on newsprint... considering it was after midnight and I was not fully sober, I'm surprised I broke 5 minutes. Slight hiatus as I enter tech week and try to finish some orchestrations. See you Tuesday, perhaps. Again, NYT is from Westchester a couple weeks ago. Solved the NYT at the Westchester tournament, where it was puzzle #1. ... well, not much time. But I'll note a few relevant things. Met a few new NPL members (new to me, not the NPL) at the annual Magic Wok dinner organized by Adam Cohen. That table tennis center is shiny and neat - I would have liked to grab a paddle and play, but all fifteen (maybe twenty?) tables were in use at 9pm on a Friday. I managed to solve the tournament puzzles before having to judge them. The finals grid (very impressive) will appear this Thursday, the rest next Mon-Wed. Wednesday's puzzle will be the debut of blog-commenters-turned-ACPT-buddies-turned-constructors Sara Kaplan and Barry "KarmaSartre" Franklin. Sara, a Westchesterian, was in attendance, and asked if I would speed-solve against her on her puzzle, which I was happy to do. I didn't beat her by much - it would have been close if Will hadn't changed a few words in one of her corners. During the Introduction Of The Judges, Will Shortz mentioned this site and the fact that I usually don't write anything to go along with my times. Well yeah, it's not a blog! While he set the room atwitter by revealing that I can do a Monday NYT in 1:20something and a Newsday in 1:06, it should be noted that Tyler Hinman can, too. It's not like I'm lapping the field here - I'm just the only one running around shouting "Look at me!!" Computer is back up to speed, but I'm so busy I probably won't be solving again until Tuesday. Tuesday, 10/4/11 & "Behind the Puzzle"
SPOILERS below if you haven't solved it. JUGGLING PINS was the first theme idea I ever had, back in '08 when I was first getting into crosswords. I used to juggle regularly with my drummer friend Brad during summer theater stints in the early 2000s. But we never juggled at home in New York, and I haven't kept up with the hobby. It occurred to me that JUGGLING PINS was a perfect (and original) theme-revealer, so I tried to come up with three other phrases ending in anagrams of PINS, like GO FOR A SPIN, CHEESE NIPS, and I don't know what else, but I never ended up with a usable set. Fast forward a year, when Brad sent me a text saying "dude. do you have free time this week. wanna go to the park and juggle?" We didn't, but that reminded me of my aborted theme, and triggered the idea that the PINS could be scattered throughout the grid instead. When I laid out the revealer entry near the bottom, I saw that I could cross CLOWN through the central "L" and arrange the PINs to create a cool visual "aha". From there I spent most of the summer constructing the grid. My first attempt was 76 words, and when I ran the design by Patrick Blindauer, he wisely advised me that it would be too ambitious, what with all the diagonal constraints. I think I ended up using the tweaked 78-word design that he sent back, so thanks Patrick! The two key elements for me were to have a PIN in each of the eight possible configurations, and to array them as if the CLOWN were juggling them. The problem with that was that I couldn't use the bottom few rows of the grid, so I thought the "dropped" PIN in the SW corner would be a cute touch. Once ENTERTAINED (or ENTERTAINER) fit nicely as a long Down, I tried to come up with a symmetrical entry that could also be tied to the theme, but that was too much for a novice to handle. I didn't (and still don't) have a word list other than Matt Ginsberg's database, so I filled the grid very slowly. No doubt a veteran constructor could come up with better fill -- and I considered asking one for help -- but I figured it would be good enough to pass muster for a Tuesday. Not too much crosswordese, I hope, and the only iffy-for-a-Tuesday entries might be DONEN and CERA (and at least there's one for each generation there). Then I waited six or eight months to actually send it to Will, because I was re-thinking corners, tweaking clues, and doubting whether the puzzle would be good enough at all. I'm interested to see how many clues were changed, since I generally went with inoffensive rather than innovative (I'll update this post when I see the final version [[UPDATE BELOW]]). Will accepted the puzzle exactly a year and a day ago, and I got the email in the middle of a twelve-hour tech rehearsal in Michigan. And there you have it: my first submission, my first publication, and possibly the only puzzle you'll ever see from me in a newspaper. I haven't had any other good ideas since then, and constructing isn't that much fun for me anyway. I'll stick with the solving for now. Otherwise, I'm pleased that the shout-outs to favorite shows The Amazing Race and Arrested Development (topical!) survived. ALEC was originally [Brother of Stephen, Daniel, and William], because I have a brother named Stephen. I liked [Words unsuitable for The New York Times] for OATHS. And my most creative clue didn't survive: [The IT girl, maybe?] for NERD. I suspect that NYT style would render that as "I.T. ", which would kill the joke even if Will liked it. I'm a little under the weather, which is why I solved so late and relatively slowly. But I'm very excited for 10pm tonight, when my NYT constructing debut drops! My write-up about it will post at that time. Don't like to skip Thursdays, but I don't even have a half hour to solve... back tomorrow! Yes, that's a Sunday "Challenge" record. I also caught up with Squaresville Puzzles: "Beverly Films" 1:43, "Themeless" 2:51. My time on "Split Ends" would have been 3rd place at the NPL Con - behind Tyler and Trip and ahead of Eric Maddy and Francis. This is post #1000! Thank you to my tens of readers for your continued support. I've just learned that George R.R. Martin's LiveJournal is called Not a Blog. He is such a liar! I test-solved the Lollapuzzoola finals (re-published in the NYT today) in 5:35. Jangler has some new puzzles up since last I checked (hat tip: Tyler). Been relying on Andrew's Puzzle Links to find self-published puzzles, so send him tips! I'm going away for the weekend, so next update will be Monday! I see Joon beat me soundly on the NYT today... I couldn't make much headway in the NE corner until guessing FLAB. Lollapuzzoola was a smashing success once again. It's a good thing organizers Brian Cimmet and Patrick Blindauer booked a bigger room in Manhattan, because there was a huge walk-in crowd and somewhere around 170 people competed. Jeffrey Harris took the title again, edging Al Sanders and Dave Tuller on the big boards. I enjoyed my first full day as a judge, collecting papers, grading them, and joining the Google Team when needed on the hardest puzzle. Fun and pizza was had by all! Puzzle 6 (Express Finals) - 5:35 - which certainly would have won, even allowing for whiteboard awkwardness, but the clues were toughened up a bit after my round of test-solving. Off to Lollapuzzoola in the morning! Once again I'm volunteering/proctoring/judging, and enjoying the festivities and camaraderie without the pressure. The puzzles are outstanding, the pre-registrations are way up over last year, and the new venue is apparently very well air-conditioned. Should be fun. Andrew challenged me to beat last week's Rows Garden time using the Easier version (with "Blooms" in grid order, rather than random). Fail! Taking the day off again... no time for the Sunday smorgasbord. I realized that I hadn't ever solved Berry's "All-Star Game" variety from a couple weeks ago. So now I'm caught up. And we're all caught up. Still working on the other project, so crosswords will wait until tomorrow. It's my birthday, and I'm not doing any crosswords. Mostly because I have a paid puzzle assignment to finish. Taking the day off, possibly tomorrow too. The Newsday isn't harder than usual, it just took me a while to get my brain in gear. I learned from the Aries site that Triple Play Puzzles added a new Rows Garden two weeks ago. Still haven't done Patrick Berry's last website puzzle... it's Rows Garden overload around here. Heading back to New York tonight. Fun brunch with puzzlers - pretty much the whole Bay Area contingent, in fact. Heading out of town for the weekend! Solving will be sporadic through Tuesday. Didn't think I'd finish the acrostic without cheating, because I had only 3 or 4 sure answers. Guessing the first word off of 3 letters got me started. NPLer Nathan Curtis is attempting to post a new puzzle every day in June. They won't all be word puzzles, but the variety crosswords already on his site are solid, so if you can't get enough Spirals and Marching Bands, check it out! I've also been meaning to plug a new site called 14 Across. It's developed by an Israeli fellow, and allows easy uploading and solving (and apparently selling) of crosswords. There are no quality puzzles on the site yet, and the solving applet could use some work, but if it ever takes off, the site could be a fun and useful tool. I didn't see the NYT's DAN clue until I already had it filled in and glanced over to confirm. Shout-out? I'm going away for a couple of days and will return to the "blog" on Sunday. Sorry about the hiatus there - I couldn't log in to Blogger for a couple of days. Turns out clearing my cookies did the trick. But I'll still blame it on Google! New record on the Newsday. Clearly it's possible to get under 60 seconds on a very easy 15x15, but I won't go out of my way to make that happen. Monday update: This is post #900, and I think a speed record for 21x21. *Solved in the WP.com applet. Weird rare-fill coincidence between the LAT (1-Across) and ND! Not sure I've ever seen that entry before. I went back and re-entered my missing times from last week. For completeness's sake, you know. Forgot that I'd hit 1:09 again on a Newsday puzzle. Home in NY, and I managed to get some time off today! I'm traveling back to NYC today, and working all day tomorrow, so I'll be puzzle-free until probably Wednesday. update: OK, now I'll be puzzle-free until Wednesday. Also, dammit, my Thursday posts are still missing. I want my money back! I'm back! Will probably finish catching up tomorrow. Gonna take a couple days off. I'll be back home in New York in a week, so I may just wait and solve the LA tournament puzzles on paper then. Huh! The NYT's Wednesday puzzle took me longer than any other this week. I bought the Crosswords LA puzzles, and will solve them when I have a chance... probably won't bother printing them out, but I'll post my Across Lite times. If anyone wants to test-solve an easy puzzle (custom, not for publication) today or tomorrow, let me know! CrosSynergy times are back. Alex pointed out this converter that will convert .jpz to .puz, which I encourage everyone to use, if only to stick it to Litsoft. Matt Ginsberg made a convincing post to cruciverb-l a couple days ago suggesting that Litsoft has no legal leg to stand on in trying to eradicate their fifteen-year-old, unpatented intellectual property from the marketplace. I mean, are they going to break into my computer and take Across Lite from me? I've still got a crapload of old .puz files to solve, and I'm not going to use Puzzle Solver. Is it the end of the line for CrosSynergy .puz files? If so, I'll hold my nose and solve selectively (e.g. Blindauer, Peterson, Klahn, Sundays) but won't be posting times anymore. I'll do puzzles in the afternoon, but meanwhile here's the story that aired today on WDET, Detroit's NPR station. Caught up with the last few days. For the record, put me down for loving the Fireball this week. Managed to find some time tonight, but probably won't be back until Saturday. I'm experiencing technical difficulties and short on time this morning. May end up waiting until Monday to catch up. Solved the NYT in a radio studio at WDET in Detroit. My "competitor" (Morning Edition host Pat Batcheller, a puzzle fan) was narrating his own solving progress, and the grid was printed on the top right, but I managed a good enough showing. WDET will air the piece about me sometime next week. Probably won't be getting to Sunday's puzzles until Monday evening. And if not, it'll be Wednesday. Monday afternoon I'm doing an interview with Detroit's NPR station, WDET, wherein I'll solve the Sunday and Monday NYT puzzles in front of the reporter. Will let everyone know when that's on the radio and online. I should have been clearer with yesterday's gripe! I'll keep solving the CS as long as there's a .puz available, but once that dries up I imagine I'll just drop it rather than get frustrated with a different solving program. I tried out Crossword Solver for the first time, to solve the CS puzzle. I think it's going to be the last time, because that program seriously stinks. Sorry to say it, but I'm not going to bother solving CrosSynergy puzzles anymore until the situation changes. I tried to post this last night, but couldn't - I just upgraded from IE 8 to IE 9 because of issues with other sites, and for some reason the "Publish Post" button here wouldn't work in IE 9. Anyway, the upshot is that I'm finally using a grown-up browser (Chrome). Nice to have the Newsday puzzle put up a fight, even though it's because the theme and fill are both kind of substandard. Yeah, the Charlie Sheen jokes are played out and won’t age well at all, but I’m not going to come up with something cleverer on my own. This loooong post is spoiler-free until the very end, at which point you will be warned. Where to start? I already talked a little bit about the Friday night fun, where I had a small serving of humble pie in the cryptic crossword contest. I did well, but was hoping for better than 10th place on the British puzzle and maybe 15th-20th on the American (and that’s without the dozens of top solvers who skipped the event). Retired to my hotel room around 12:30, thus breaking my promise last year to hang out more. I’ve finally realized two things: getting into bed relatively early does not get me more sleep, and none of my competitors are getting much sleep either. Next year I really will socialize more. I got to at least chat a little with most of my pals from tournaments past, but I regret not getting more than brief hellos with Matt Gaffney, who was one of my favorites even before he started serving up free weekly genius. What I do not regret is bringing a small stack of puzzles from home (NYTs from 2005 and Saturday Stumpers from 2006) and polishing them off before and between tournament rounds. “Readers” of this “blog” may not know that before solving the day’s puzzles, I almost always warm up with some old puzzles (between 2 and 12, depending on how cobwebby the brain is that day). After all, I have a reputation to uphold, so I want those times to be optimal. Anyway, this was most useful on Sunday morning. During the less absorbing talent show acts, I solved BEQ’s Sunday Times puzzle, two Stumpers (one of which had me stuck in a corner for quite a while), and two NYT freestyles. I finished by flying through a Saturday by Patrick Berry, which gave me confidence for Puzzle 8, and cracked me up when I saw this answer (Puzzle 2 spoiler!). Going back to Saturday morning. I didn’t get to the ballroom early enough to have my pick of seats, so in order to be in my usual position (last row, right half) I had to sit next to Stella Zawistowski -- who of course is delightful, but she wasn’t thrilled about the situation at first. Stella ended up handing in two puzzles before me (when we were in the same minute), so I think it worked out OK. Puzzle 1 started out Monday-easy, and for the first half I was actually considering a sub-2-minute solve. But I lost the groove a bit in the bottom half, and mis-wrote some letters in 46-Down, finishing at 2:20. Puzzle 2 wasn’t as hard (or outside-the-box) as I’d expected from Pete Muller, and I was somewhat familiar with the theme. Solved in 4:05, and if only I’d done that Berry puzzle earlier, I wouldn’t have spent time wondering about 3-Down, and might have broken 4 minutes and beaten the room. Apparently I did beat the room on Puzzle 3 (4:50), which surprised me, because it was typical Merl and didn’t have much in the way of weirdness or traps. Except for those short theme answers, I guess -- when I filled in 57-Across I just assumed it was someone I hadn’t heard of with a Merl-y clue. Lunch, like last year, was a Wendy’s meal back in my room. The restaurants get overwhelmed at the lunch break, and I wanted to decompress alone for a few minutes. Puzzle 4 was a Wednesday theme with Tuesday clues, and I didn’t have to push too hard to get in under 3 minutes (2:45). And then there was Puzzle 5, by Mike Shenk, whom I’d considered the least likely of the viable candidates for that slot. I found the overall cluing harder than last year (as did most people, I assume), and didn’t grasp what was going on with the theme until about halfway through. Spent a lot of time looking at 81-Across, which I’d never seen before (not thinking of the common French word that adds a prefix to it! ), but I was satisfied with the crosses and finished up around 8:40. Out in the hallway, every A Division contender except for me and Francis was leaving the ballroom with head in hands, claiming to be out of the running. I kept pointing out that if everyone tanked the puzzle, everyone was still alive! Puzzle 6 (4:15) was typically unexciting, but I totally laughed at the pun at 81-Across. My girlfriend Gretchen came over at dinner break, and we joined Eric Berlin and Katherine Bryant for a reprise of our meal last year, when we'd happened upon a great Mexican restaurant on Pacific Street. Peter Gordon, Kiran Kedlaya, Thomas Weisswange, David Moulton, and Kevin Wald came along to make it a nice big-but-not-too-big group. Back in the ballroom later, the one-act play exceeded expectations, and the “ACPTzing Race” extravaganza by Greg Pliska and John Chaneski was pretty brilliant, though maybe a little too difficult overall (I think about 20 groups out of 100 were able to finish). Gretchen and I roped in Michael Smith and Patrick Merrell to solve with us, and we gave up with aching brains and a couple puzzles left. Late in the game I went to beg a hint from Pliska, and apparently I was the first person to claim I was holding a Fast Forward pass. Went to bed earlyish again, and couldn’t fall asleep for way too long again. By Saturday night I knew I had a four-minute lead on Anne, and wasn’t in any danger of missing the finals unless I turned in an error. So I took it easy on Puzzle 7, finished in around 8:35, and double-checked theme answers and thorny spots for another minute and a half. Checked out of the hotel, grabbed (more) coffee and a sandwich from Starbucks, and chilled out until it was time to pile into the ballroom for the marquee events. AND HERE COME THE SPOILERS FOR PUZZLE #8. BEWARE! Let’s just fast-forward to the A finals, since this is too long and Tyler has already spoken of the brick-pooping in the back room and the craziness of the B finals. I wasn’t too nervous, though I was more afraid of Tyler next to me this year than I was of Howard last year. I mean, dude won five in a row and hasn’t missed a letter in competition since, what, 2002? I got started, and my five-second “head start” was immediately erased by Nancy Schuster, who accidentally tapped Anne on the shoulder right away. (Gretchen was ready to file a complaint if the finish was close, which… didn’t turn out to be a problem.) I scanned the clues like the proverbial headless chicken before settling on “dysphonia” as a concern for ENTS, but couldn’t get anything to cross it. (Why haven’t I learned the elementary skill of looking for fill-in-the-blank toeholds? Then again, none of these FITBs would have been gimmes.) I kept coming back to [Figure in “The Greatest Game Ever Played”] because I knew I’d heard of said game, but couldn’t pull it up until I had a few letters in UNITAS. So I jumped down to STINE crossing ITALIC and then KHAN -- never saw that movie, but 1982 + sci-fi was enough -- which was enough of a chunk to get me going. I ran into a wall after completing that center-right section, and putzed around for a bit (putting in that all-important E at the end of [Chemical suffix]!) before completing the top right and dropping ETERNAL OPTIMIST into the bottom section. I’m thinking those 15s helped make this grid easier than many finals, because all those free letters were there when moving into a new quadrant. I really started feeling good when I put in LEAD A DOUBLE LIFE with only two letters on the board -- though I had SO FEW in mind, which provided that tell-tale “-IF-”. (Didn’t even think of LIVE as the first word; Tyler was wise to wait on that.) (Also, seems to me like the A-level clue for SO FEW was the easiest of the three.) From there it was pretty smooth sailing. No idea how I’d heard of DIGITALIS, but that helped a lot with the bottom left. The only scary moment was the clue for GUN IT, [Charge when a job is done?]. I knew that had to be the answer, but the “aha” never clicked into place. Afterwards I talked with constructor Mike Nothnagel about it, and told him (as I’d still argue) that I thought that clue was too much of a stretch. The last letter I put in was the “U” in SHOUT. I didn’t even notice this coincidence until afterwards: next week I’m going to Michigan to work on a production of… Shout! I was glad to have defeated Tyler head-to-head, which I didn’t get to do last year. I was glad that Anne finished perfectly, which she didn’t get to do last year. And of course I had a marvelous time hobnobbing with old and new friends for a weekend. I wonder if the same five or six people are going to monopolize the A finals for a little while, like that period when it was always Ellen/Jon/Doug/Trip/Al. I also wonder if I will manage to solve fewer crosswords in 2011. After last year I thought for sure I’d slow down, but that didn’t pan out -- I still feel like I want to catch up on all those years I wasn’t doing puzzles. And because I’m posting times here every day, my pride may not allow me to slack off. Oh well. Four years, nine trophies... I’m coming for ya, Mimi Raphael! Not planning to continue downs-only, but it's a fun change for now. ACPT post later today! Don't feel like doing puzzles this morning... I'll probably get to them later today so I can see what commenters everywhere are saying about me. God forbid I get spoiled on a Monday puzzle! Ben Zimmer's videos of the A finals are embedded in the BEQ recap here. And Nancy Shack has the B and C finals. So Saturday went pretty well. I'm all but assured of a finals spot, and I just have to hope for good mojo on that last freestyle puzzle by Mike Nothnagel (on whose LP2 final I once beat Francis by all of 8 seconds). See you afterwards, and hit up the Puzzle Brothers for a live-blog of the festivities. So Sunday went pretty well too. Once again, I intend to write about the tournament here this week, and this time I'll really do it. Thanks to everyone who makes the ACPT happen, hellos to friends old and new, and congratulations to all the other winners -- I'll note that we've had three consecutive B Division champs who are "readers" of this "blog". Of course, you can read all the coverage at the website, where the links section should resume updating tomorrow. To any new readers who followed the link on the ACPT page: Hello! This is not a blog, where people do not write interesting things for you to read. Here we go with ACPT Day 1, I'm off to warm up my pencil. Standings will be updated here throughout the day. My NYT time doesn't count at all. I test-solved this puzzle about 7 months ago, and although Pat Merrell rewrote about a third of the grid (the W and SW), I remembered some of the answers. It'll be interesting for me to compare clues, since I've never seen the before-and-after-Shortz clue-editing process up close. At 10:50 Central today, I'm appearing on the Norm Hitzges Show on Dallas's Sportsradio 1310, "The Ticket". Thanks, ESPN The Magazine! Puzzles this afternoon. BEQ sent me an advance copy for his interview today. Also, I'm in a brief ACPT piece in the current ESPN The Magazine (page 28). Betcha smoked me on the acrostic again, Joon! I made it extra-difficult by forgetting the Maori city and misreading "Editor" as "Either". Saved myself by recognizing the author's name. Probably won't get to the rest until Monday. Hey, can anyone explain this clue from a 2005 NYT puzzle? Where are we talking about here? I ran into it yesterday and had a hell of a time with that first letter since the crossing is weird too. Thought I might as well speed-solve the NYT cryptic on paper, so as to prepare for the ACPT cryptic event. I had all but 3 answers in 5 minutes -- missing 21, 23, and 28. Shockingly easy Gaffney crossword... but I'm not gonna waste much time on the meta, because I have lots of real work to do, and am not exactly in the running for a prize. Got a very busy couple of days ahead (for once), so I probably won't be back solving until Thursday morning. It's a big day for Not a Blog! This old post has hit 100 comments, only one of them by a human. I delete all the other spam, but for some reason that post has attracted most of it. NYT 5:05 ... LAT 4:08 ... MR 4:38 ... BG 4:33 ... ND 4:12 ... CS 3:01 ... WP 3:50 ... 3-D Word Hunt ~27 in 15 min. Newsday today makes me sad, and not just because there's a mistake in the answer key. Over/under on construction time: 90 minutes? *I had no idea about square 10, so I guessed a different bird beginning with the same letter. Across Lite would have accepted it! Heckuva MGWCC yesterday (which I solved today)... even after getting the theme, it was still crazy hard, especially the SW corner. I'm pretty sure I test-solved PB's NYT puzzle for him last year, because I had a weird feeling of deja vu while solving. So I won't count it as my fastest Thursday. Paper again, aiming for under two minutes on the three easy puzzles. Just missed on the first two, but got into the right groove on the NYT and lowered my record by one second. I won't be using paper every day, just got on a little kick there... Probably will print Fri/Sat/Sun most weeks until the ACPT. You may know that I like to collect crossword books. Nowadays, Peter Gordon's Puzzlewright Press is pretty much the only game in town, publishing outstanding new collections by Berry, Longo, Quigley, et al., as well as reprints of LA Times and CrosSynergy puzzles. And the Simon & Schuster series provides many, many hours of solid (if usually unexciting) entertainment. But to make up for years of lost time, I go looking on Amazon.com for out-of-print volumes, which is how I found gems like this collection of GAMES Magazine puzzles and this Henry Hook extravaganza. 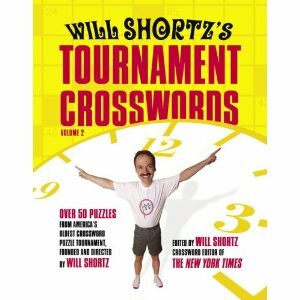 The Holy Grail of my search was Will Shortz's Tournament Crosswords, Volume 2. It was published in 2005, but not a single copy has been available from a reseller since I added it to my Wish List two years ago. Volume 1 was available, but cost more than $50, so I held off. Fast forward to two weeks ago, when all of a sudden I saw a copy of Volume 2 for sale. (No thanks to Amazon, whose "Sign up to be notified when this item becomes available" feature clearly doesn't work.) And it was only $10 including shipping! So I bit the bullet and bought both volumes, which arrived in the mail last week. Now I can play along with every ACPT from 1990-2004, and pretend that I would have taken some championships away from Delfin and Hoylman if I'd been competing back then. (Of course, solving pressure-free on my kitchen table is a little different from the Stamford ballroom, not to mention the lack of a whiteboard for the final.) Both books provide a "percentile" guide with the answers, showing how many competitors finished in 3 minutes, 4 minutes, etc. And starting with 1996, the tournament website has the detailed stats for comparison. For instance, my performance at the 1998 ACPT "would have been" nine minutes faster than winner Trip Payne (with the asterisk that I was already familiar with the crazy Puzzle 5 gimmick thanks to BEQ having blogged about it). More important than the ego boost: just like with the SAT, there's no better way to train for the ACPT than with actual practice tests. What I'm saying is, I'm really going to be unbeatable this year. Kidding! The style in the early '90s is slightly jarring, though I've solved enough old crosswords to be used to it. I was most surprised to see a couple "cryptic" clues that don't involve any kind of definition -- something like [Time's up?] for EMIT. I wasn't surprised by the occasional "numeral-for-letter" convention where I's and O's can do double duty. Similarly, while I've seen some great gimmicks already in the four sets of puzzles I've done, there were also some boring themes back in the day. 1991 alone has a quip in the 21x21 and two "free association" themes where the long answers all have to do with an arbitrary word (American Red CROSS founder; Christopher CROSS song; "CROSS of God" orator; you get the idea). The craziest theme is 2002's Puzzle 5 by Cox & Rathvon: a short story containing each fill word represented by its clue! (We were standing near the 14D in the bow of my 47A, the "62D," ...) I haven't done that one yet, but I can already imagine how discombobulating it will be to speed-solve. I hadn't realized that Merl's self-professed favorite puzzle, "Gridlock", was from the 1990 ACPT. I think I've solved it before, but it still took me almost 10 minutes. 1992's final puzzle by Eric Albert was entitled "Wow!" and billed as the first computer-generated crossword in tournament history. (Albert, as you may know, was the first real innovator in grid-filling software.) The 62-worder (in the shape of Manny Nosowsky's last puzzle) is just fine, but of course lacks any cool seed entries, and probably wouldn't pass muster in today's NYT. I wrote up most of my big post today but ran out of time. Tomorrow for sure! This won't be like my ACPT wrapup, I swear! Sorry, let's say tomorrow -- I have actual work to do today! Asterisk on the Reagle because I realized a little way in that I'd solved it before (maybe a month ago). At least some clues were new! And congrats Joon on the NYT -- I was perhaps looking for more bleeding-edge entries in the long fill, as I've come to expect from you young-turk freestylers, but I'm totally satisfied with rock-solid fill and fresh cluing. Actually, looking at it again, those four vertical 8s are quite nice. And and, my much-anticipated Amazon purchases arrived in the mail, but I'll elaborate in a day or two when I have time.